You can make a set of these DIY Halloween glasses in under 15 minutes, so you have plenty of time to party! The last time we moved, I found a box in a storage room that was nothing Halloween cups. Plastic cups, ceramic mugs, water bottles shaped like pumpkins. All kinds of holiday drinking ware that was lost and forgotten in a storage room for years. And I promptly took that entire box to our local Goodwill and haven’t missed them for one second since. We just do not need to be storing different glasses and mugs for every different season. There isn’t room and it certainly isn’t necessary! But don’t mistake that for me thinking that not going all out for holidays isn’t necessary. Holiday decorating, holiday themed food and holiday clothes are all completely essential and necessary in this house. These DIY Halloween Glasses are the perfect compromise between trying to scale back on clutter and still bringing some holiday cheer into the house! The glasses are actually our normal, every day glasses. We use them constantly for juice, wine and more. But normally, they’re just the clear glass. With my Cricut, it’s easy to quick cut some black vinyl, adhere it and it feels like you have brand new drinking glasses for the whole month of October! Find the designs you want to cut using your Cricut. I opened a new project and then clicked on “Insert Image” in the left sidebar. From there I entered “Halloween” in the search bar. There are hundreds of images to choose from. I chose 4 that all had an image in a circle because it looked cohesive and similar to a complete set you could find in a store. I measure my glasses and sized my images appropriately. Mine ended up being 2.208″ wide each. I loaded the black vinyl onto the cutting mat and let the Cricut do it’s thing and cut it out. Using transfer tape, I applied the designs to each glass and I was done! Fun, festive glasses that get us in the Halloween spirit in less than 15 minutes and for probably less than $1 worth of vinyl! In fact, these designs are so small that you can probably find some vinyl scraps in your stash to create them with! It’s seriously possibly to get an entire year worth of various holiday-themed glasses out of the same glass! No more boxes filling up your storage room with things that only get used for a few weeks a year! These Halloween Popcorn Bags would go perfectly with your glasses! It’s a great way to fill up the food table at a party without spending a lot of money! These scrap wood ghosts are another easy Halloween craft that can be made in under 15 minutes! 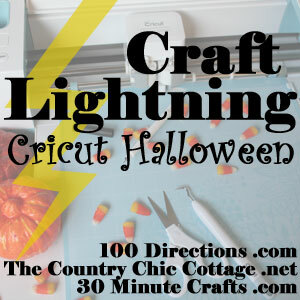 You can even use your Cricut to cut out the shapes for the faces to make it go faster! Or use your Cricut to cut out Frankenstein faces for some Halloween Pudding Cups! I wish I would have had my Cricut when I first made these! It would have made the job go SO much faster! And don’t forget to pin today’s project so you can make your own glasses for each holiday! So spooky and perfect for a party! Such a great idea to make for a Halloween Party!